Happy new year to all! Every year that goes by, I marvel at how quickly the year has passed. Nevertheless, 2019 is here and, with it, comes a chance to learn and grow. Late last year, I became increasingly aware of an issue that affects all of us. The issue is that of the disturbing rate of physician mental health issues and, specifically how it relates to physician suicide. I know, not the most uplifting topic for the first post in the new year, but an important one to be aware of. However, what’s more important than recognizing that physician suicide is a thing, albeit an unfortunately prevalent one if we read or listen to the news, is the larger issue of how we treat physician mental health issues. Slowly, but surely, the conversation is starting to shift towards understanding that marginalizing mental health issues among healthcare providers, specifically those of us who deal with frontline traumatic cases, is detrimental to all. It is no longer acceptable to hide the fact that issues like depression and anxiety affect many of us. The fear of being stigmatized by our colleagues and medical boards is a large reason that many physicians do not seek the appropriate care they need. The time has come for this to stop. Maybe 2019 will be the year that we can change this. Check out this recent article published in ACEPNow about one physician’s struggle to retain her medical license to practice after appropriately seeking care for her mental health issues. Also, here’s an article I recently wrote for FemInEM about physician suicide. Look out soon for a FemInEM podcast I also recently had the pleasure of doing about this very topic. It was educational for me and, hopefully, will be for all of you who listen. A 34 y/o female presents to the ED complaining of palpitations. 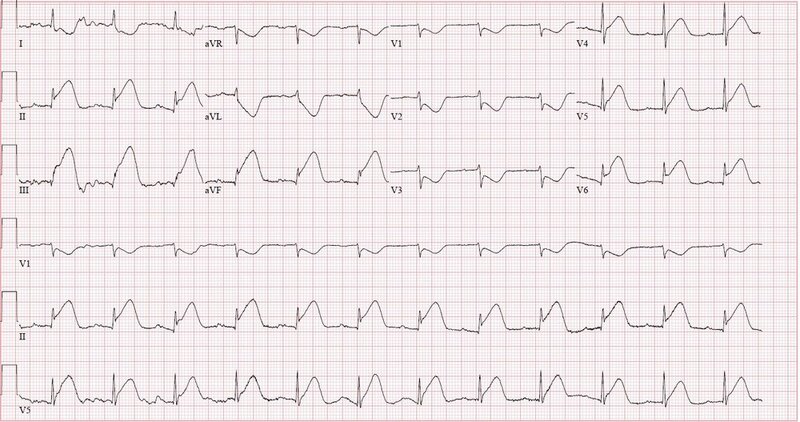 What finding does this EKG demonstrate? The EKG demonstrates limb lead reversal of the right arm and left arm. Repeat the EKG with appropriate lead placement. The EKG appears to demonstrate T wave inversions in leads II, III and aVF and can be mistaken for inferior wall ischemia. However, a closer look at the EKG reveals that in lead I the P wave is inverted, the QRS complex is predominantly negative, and the T wave is inverted. In lead aVR, the P wave is upright, the QRS complex is predominantly positive, and the T wave is upright. This is the opposite of what you expect to see in a normal EKG. This clues you in that the right and left arm leads have been reversed. With limb lead reversal, T wave inversions may appear that are not really signs of ischemia. Inversion of the P-QRS-T complex in lead I can also occur with dextrocardia. However, with dextrocardia, there will be a lack of normal precordial R-wave progression from leads V1–V6. In reversal of the arm electrodes, the precordial leads will not be affected so R wave progression should be normal. Reversal of the right leg and left leg leads usually causes no change on the EKG because the right leg lead is only a ground and does not record any electrical activity. 85 year old female with history of HTN and hypothyroidism presents to ED for epigastric pain that started a week ago. Pain is postprandial, moderate in intensity, stabbing, continuous and radiating to the RUQ. Associated with nausea but no vomiting. Currently denies abdominal pain but complains of nausea. She denies any fever, chills, constipation or diarrhea. The following images were obtained. 1. What is seen on the above ultrasound image? 2. What disease processes could lead to this ultrasound finding? 3. What are the ultrasound criteria for cholelithiasis? 4. What are sonographic findings in acute cholecystitis? 5. What complications can arise if the above condition is not treated? 2. Gallbladder perforation is most commonly due to occlusion of the cystic duct by gallstone and subsequent retention of contents. The associated rise in luminal pressure limits venous and lymphatic drainage, leading to vascular compromise, necrosis, and ultimately perforation. May also arise due to laparoscopic cholecystectomy. 3. 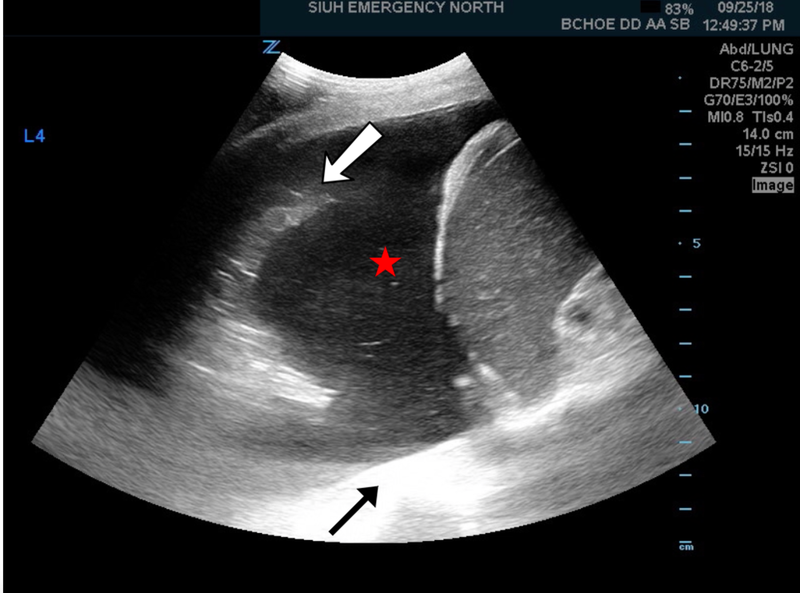 Cholelithiasis (blue arrow): highly reflective echogenic focus within gallbladder lumen, normally with posterior acoustic shadowing. Stones will also show gravity-dependent movement. This EKG comes courtesy of Dr. Majlesi. An 81 y/o male presents to the ED complaining of generalized weakness, difficulty speaking and shuffling gait. He has no chest pain or SOB. His vital signs are normal. 1. 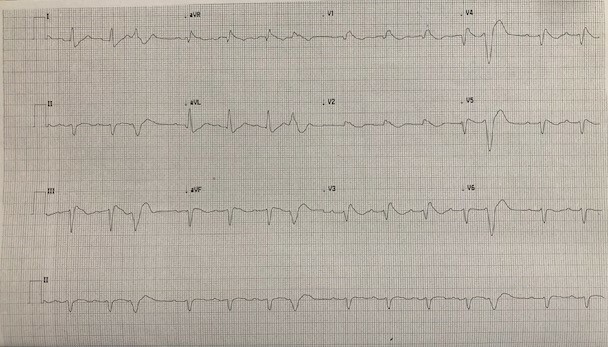 What are the findings on this EKG? 2. What can explain these findings? The EKG shows an extreme right axis deviation with negative complexes in leads I and II and positive complexes in lead aVR. Several things can cause these findings including COPD, limb lead reversal and dextrocardia. 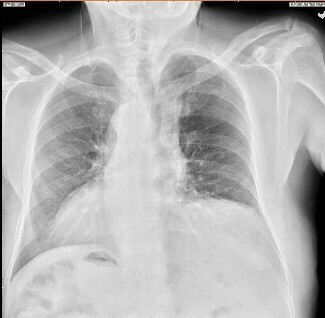 In this case, the patient was found to have situs inversus. In a normal EKG, the P waves in leads I and II should be upright and the P waves in lead aVR should be inverted. This EKG shows the opposite - negative complexes with inverted P waves in leads I and II and positive complexes and upright P waves in lead aVR. This pattern can be seen in severe COPD or in limb lead reversal (if the right arm lead is placed on the left arm and the left arm lead is placed on the right arm). However in that scenario, the precordial leads should be normal. In our EKG, the R wave progression in the precordial leads is reversed. The QRS complex is positive in lead V1 and negative in lead V6. This occurs because the entire heart is reversed. Our patient’s Chest X-ray is below. As you can see, the heart is reversed and on the right side of the body. Additionally, you can see the liver on the left side and the stomach bubble on the right side. This represents complete situs inversus. This is why the patient’s EKG is essentially reversed. 92 y M hx of afib, CLL, Lymphoma pw difficulty breathing and cough. The following was found on bedside sono of the right lung. 3. What are the names of the ultrasound signs seen above? 4. What is Light's Criteria? What would you expect the results to show if you were to aspirate a sample from this finding?